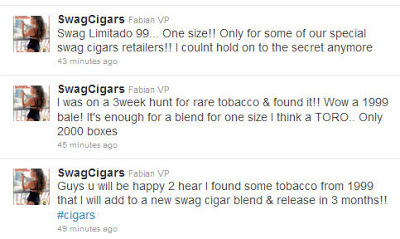 There were some posts from Swag Cigars on Twitter today. A new limited edition blend is development from Swag Cigars. The details have said that there was a 1999 bale of rare tobacco found. The plan that only about 2000 boxes will be blended. It will only be made available to select dealers of Swag Cigars. A single vitola will be blended – and as of now, they are thinking of a Toro. The plan will try to release in the next three months. Of course, this is subject to change. Swag Cigars was a new line launched by Oliveros last year. For 2010, I ranked the Swag as my #19 Cigar for 2010, so I’m expecting great things from this blend! Stay tuned to Cigar Coop for more details.